See Emily's segment on The Art of Living TV Show! This was a retirement dream. I hiked a month each summer for nearly ten years, slowly inching my way through 14 states towards trail's end at Mt. Kathadin, Maine. 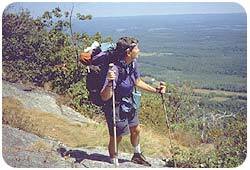 AT hikers of all ages and walks of life form a tight and caring community on the trail. I learned so much about handling adversity, getting along with different people, and staying focused in order to reach my final goal. Trail name was "Tooth." My second retirement dream! 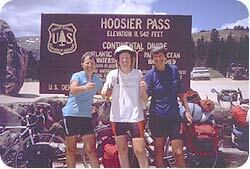 Five of us pedaled through ten states and over four major mountain ranges to reach the Pacific Ocean in Anacortes, WA. We were self-contained (no van following us! ), camped out and cooked our own meals making the trip affordable. We witnessed from the seat of our bikes the majestic beauty of America, and the warmth and friendliness of the people in small towns along the way. A group led trip. Eight of us from England, America, Ireland and Australia trekked 192 miles across northern England from St. Bees Head to Robin Hood's Bay. We hiked through three National Parks and stayed in quaint B&Bs in small villages along the route. I biked 1,200 miles around these two beautiful areas visiting cozy villages with piled lobster traps, fishing boats at anchor, and cod drying seaside in the sun. Spent one awe-inspiring night as the lone camper in Kejimkujik National Park by the sea. 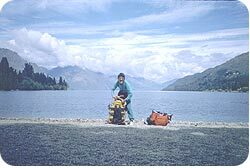 I roamed New Zealand from Queenstown to Rotorua to Cape Reinga riding my loaded touring bicycle 1,800 miles through alpine heights and sheep ranches, past crashing waterfalls and glacial lakes. Managed to also hike the Routeburn Trail and the Abel Tasman Coastal Track in the South Island. Ah, beautiful, friendly Ireland, so hospitable to bikers. Visited the Ring of Kerry, the Beara and Dingle Peninsulas. Rode through the Burren and around the Connemara Mountains. Ferrying to Wales I explored the Gowan Peninsula and the Wye River Valley, and ended my 1,200-mile journey by riding through the Cotswalds, Bath and Stonehenge in England. Three of us canoed from the beginning of the Suwannee River in Georgia on a two-week paddling trip into Florida. Five of us went into the Wilderness with nothing but a blanket and a knife and spent two weeks learning how to survive. We build traps and caught snakes, rats, and rabbits. Learned to make rope from grasses. Carved our own spoons and slept on beds of hot coals at night to ward off the desert chill.